WebNos™ is the UK's most comprehensive management tool for keeping track of all aspects of Governance for defibrillators. The system not only allows regular checks to be maintained but also allows for a complete and holistic record of the device to be made available to the Coroner in the event of death. The WebNos system is a national database of all community defibrillators along with the scheme coordinators and their respective ambulance service responder managers stored within. It also tracks all information relating to the defibrillator: key information, training records, maintenance issues, installation safety, in/out of service notifications, and investigation requests, and has a consumable re-supply feature. Users are notified when checks are required. 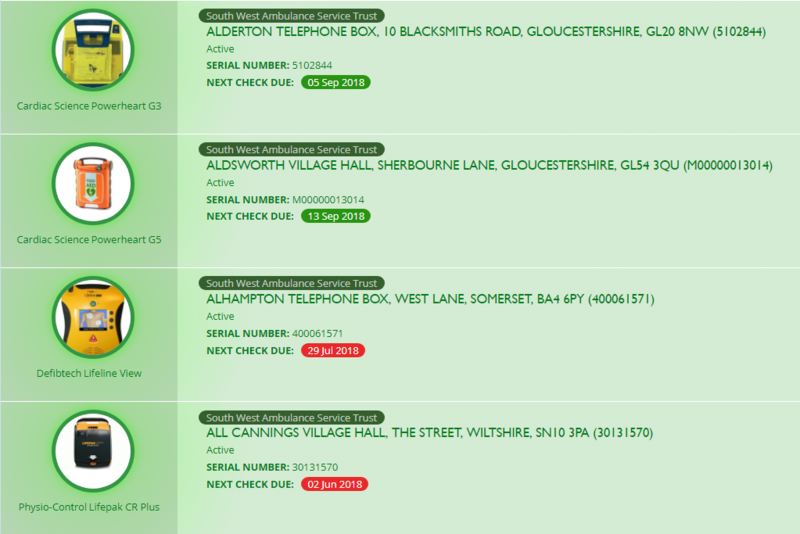 WebNos™ also tracks any telephone kiosks being used for defibrillators and makes this available to British Telecom for compliance purposes, and to track the electricity usage and granted permissions for access to the unmetered supply. It is also used for compliance by insurance companies. This is a unique service offered by the Community Heartbeat Trust, the specialists in community-based defibrillation. Weekly, Monthly, Annual checks in line with DoH and MHRA recommendations Checks to record usage of the defibrillator, reporting out of action and back in action details. Shared data across all stakeholders, along with copies of policies and procedures.